No thanks needed! Seeing that "complete scan still needed" notation by the pic of the Balladeers album just seemed to issue a personal challenge to me. I guess there are some advantages to be stubborn/Irish after all. We've got it! With great thanks and a tip o' the hat to Tom and especially Christy Blackburn (who flat out refused to give up the search), the discography page now includes a complete set of the "Les Baxter's Balladeers" album covers. At this time, a pay-per-download page of Terrea's music is in work and slow progress is being made. Details of pricing and copyright issues are yet to be worked out, but I intend to keep it as cheap as feasible without actually losing money. This is going to take a while, so don't hold your breath, but it appears to be doable. Wow, I was searching for Andrea Konow and was pleased to find this link with her name and address. I believe I was only at The Garret once or twice, I remember Jerry fondly, and even remember hanging out with Bob Hamburg on ocassion. Good luck on your site. This was a great blast from the past. Sue and I have kicked around the idea of reissuing Terrea's albums on CD, but it hasn't gone anywhere, yet. Apart from the non-trivial up-front expenses, there are unknown copyright issues to straighten out. I'll ask Sue and Terrea if there's any other specific songs they'd like to see made available here and we'll see what comes of it. Setting up a pay-per-download system would be very complex and ambitious, but I'll look into that, too. I haven't been to the site for a long time. Very chuffed to see my 'guest book' idea has worked. And the site just keeps getting better and better. Your next mission should you decide to accept it: creating Terrea Lea downloads for cd's. I'm sure a price could be agreed that would satisfy all.....i'm waiting with my pocket money! It took a near complete rewrite of the main line code, but the Guest Book is once again fully functional. I'm sorry this took so long to complete, but it's finally done. Thanks to all for your patience. OH MY Gosh! Imagine my surprise at finding Terrea Lea's name on a web-search for some subject! I was a frequent visitor at the Garret in my youth (I'm thinkin' 1965-66). What a treat to see a blast from my past. I gotta go home find her album and listen to it again. This was a great place that my friends and I could hang out when we were teenagers in the mid 60s. I remember when Terrea Lea would harrass anyone who dared get up to leave in the middle of her act. It was a wonderful atmosphere and worth the trip from Westchester. You may recall that this Web site was converted to use PHP code back in June of this year. Until now, all the HTML pages were left in place to give everyone a chance to update their links. As of today, the HTML files have been removed. Unfortunately, it will be some time before the major search engines update their links. If you get the dreaded error 404 screen, please update your bookmarks. The Garret's Web site has now been in operation for over a year. It first went live on October 10th, 2001, and November 2001, was its first full month of operation. A number of former regulars have found the site and signed in with their memories, which was the original purpose. Of course, there are still many old friends who have yet to find us. I look forward to hearing from some of them in the next year. Many thanks to all who helped me build and maintain the site. May the next year go as well as the past one. Howdy from south Georgia! I was doing a search on Bonnie and Clyde and fell across this site. Pretty interesting. Just and interesting fact for y'all, Clyde Barrow is one of my ancestors. Just thought you'd like to know! What a wonderful site to find!! I was in a reflective mood, and did a name search on Terrea Lea -- winding up here. I spent my "late teen" years there around N. Fairfax, and knew that there was always a safe haven to be found at The Garret. To hear/experience Terrea's voice raised in song always helped to put things into perspective. Terrea could "read" her audience well, and every performance (set) was met with wild acclaim and enjoyment. I can truthfully say, I never heard anyone say they were "short-changed" or disappointed with the performance. Maybe one day I'll be back to California, and travel to San Diego for a donut - even if I can't get a cappuchino to go with it. Well, I guess that Thomas Wolfe was wrong, "you can go home again". 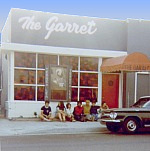 As with everyone who written a note, I too was a regular at "The Garret". I have not had as good a cup of capuccino in over 30 years. Has it been that long ? I have even forgotten when "The Garret" closed ? I long for the days when we would sit around the fireplace sharing poems and dreams. Putting some coins on the pool table, and saying "next". I remember having to go outside and around the back in order to take a leak. Thank Heavens we could still hear Terrea sing, while we went about our business. I remember yelling "Ye Haw" when Terrea would sing "Your Cheatin' Heart", and getting her pissed off. I long for the sounds of the expressio machine, right in the middle of a song. I remember the "hoot's" on Sunday Nights. I remember the News Years Eve's, and if you were a "regular" and they knew you, you could get a real "shot" of brandy in your capaccino. Forgive me if my spelling is lousy, but I'm just excited as a 18 year old finding my true love again, after all these years. At the time, I "took" my best friends giri friend from him, and then married her. Is there anyone out there that lives in the San Fernando Valley ? I have one of Terrea's old vinyl albums that I would love to get transferred to CD. I know that the quality would not be great, but it is the memory I want to re-live. Does anyone out there have any of Terrea's other albums that I can get a copy of ? Damn, we must all be getting old, and yearning for us, what we would call "the good old days". Sure wish we could re-live some things again. WITH MUCH LOVE AND HUGS. I hope to hear from anyone. We apologize for the interruption of service on July 24, 2002. Gene, the sysadmin, advises me, "It turned out to be the DSL modem needing a swift kick. All is well now." Go Terrea. I was a regular with a different girl every week, from 1962-1966. I stop by to say hello to you every year at the San Diego County Fair. You look terrific and I miss your music. Glad to see you and Sue are doing so well. You and the Garret were an important part of my younger years in L.A. "The First Time" never failed to blow me away. I've thought of you so much over the years. The nights (and days) at the Garret seem like yesterday. I hope you're well and happy. Hi Everyone. Terrea and I are slinging our famous little donuts at the Del Mar Fair, "now called The San Diego County Fair." We would love to see any of you who might be in the area. We are in the Bing Crosby Hall and are there for the next 21 days. This is our 17th year at this fair and the next one is Ventura County, July 31 thru August 11.